The Mizuno MP-H5 iron set offers the most forgiveness and playability Mizuno has ever introduced to the better player''s market. The set blends hybrid long irons to half-cavity short irons. 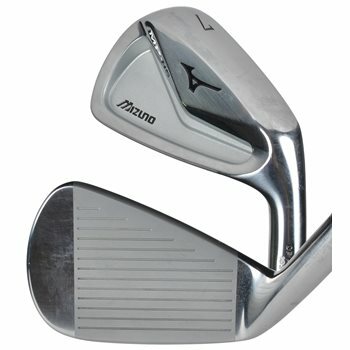 All the irons are made with Mizuno''s patented Grain Flow Forging process for a soft, solid, consistent feel. The MP-H5 was designed to deliver a higher, controllable ball flight and steeper, soft landings to attack these challenging pin positions. The hollow Construction delivers a deeper Center of Gravity (COG) throughout the set for a high launch with controllable spin. The MP-H5 achieves this “launch forgiveness” while maintaining a thin top line and minimal offset, giving the better player total shot-making control.